In this next guide in our series on Automator, we’re going to discuss the Application Document Type. 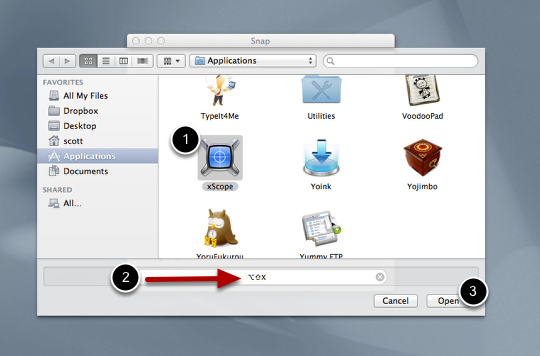 We hope that this example, while fairly simple, will inspire you to create your own Automator Applications. In this multi-part guide we’ll be talking about using Automator to help you learn to let your Mac do your work for you. We’ll start with an overview and then a series of simple examples to help you get comfortable and give you some ideas on how you can put Automator to work for you. When you open or access a file on your Mac, it tries to be smart and helpful and choose what it thinks is the most appropriate program to use with that file type. In most cases the default should be okay and acceptable but sometimes you may want to associate a particular file type with a different program. One example that I ran in to was with text or .txt files where when I would double click on them they would open in TextEdit rather than my preferred application which is TextWrangler. The process to set a new default file association isn’t difficult but it’s not really all that intuitive either so let’s show you how to do this now. One of my favorite features of the Mac OS X is the way it handles multiple desktops and manages the apps you have made full screen by placing them in their own desktop. Much like you can cycle through your running applications, it’s also very easy to manage and move between those desktops using Mission Control. By default though your Mac will include and show a desktop for your Mac Dashboard. While Dashboard can be useful with the addition of a weather or note pad widget, Apple has really minimized its emphasis and my experience is that most folks don’t use it very often, if ever. If you’re one who either doesn’t use Dashboard or would just prefer to not have it appear as its own desktop or space, it’s really easy to disable it. Why Would I Want To Know This? I got to work answering this question and once I had a solution, I realized that this would be a great example of how much easier this process is using Alfred and a great example of why I use it. I thought I would show you step by step how this works in each program so you can see the difference. In this example, I’ll pretend I have a text file where I keep snippets of code that I need to reference or reuse and somehow I accidentally moved it. Now I need to find it and move it back to its desired location. There is no shortage of ways to launch an application on your Mac. While you can add items to your dock for clicking or dig through your Applications folder, there is no substitute for a quick keyboard shortcut, a custom key combination that when triggered will open up your application of choice. Keyboard shortcuts are useful because they don’t require you to remove your hands from your keyboard while typing to navigate around with your mouse or trackpad. Use of keyboard shortcuts within your apps is handy, why not use them to launch your programs as well? The easiest way I have found to create keyboard shortcuts is with a handy free utility available from the Mac App Store called Snap. It’s one of those apps that does exactly what it is supposed to do without excessive complexity. Yes, there are a million launcher utillities and keyboard macro programs out there and indeed they are super powerful but Snap does a great job, simply. Once you have installed the application from the App Store and run it for the first time, you’ll want to define your preferences to make Snap work how you want it to. Click on the Snap Menu Item and choose Preferences from the drop down menu. 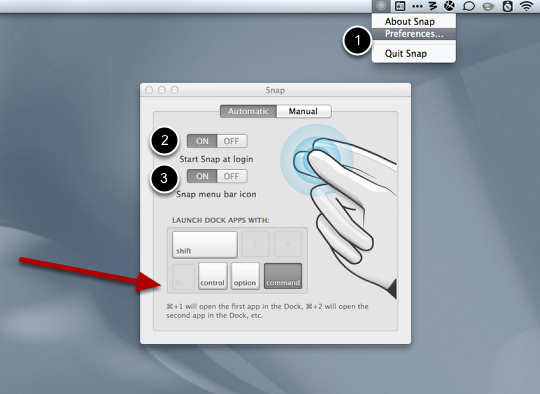 Go ahead and set the Start Snap at login option to on – this will make sure that it’s always ready to accept your shortcuts. 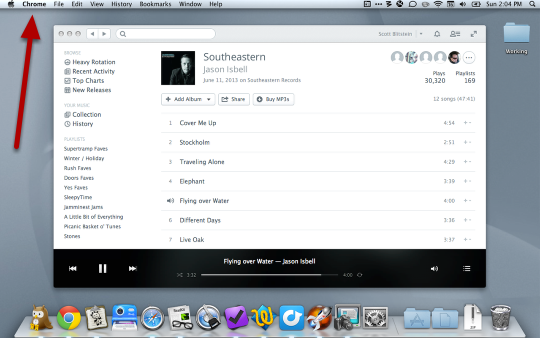 I like the menu bar icon on (although I will move it down to my Bartender Bar). 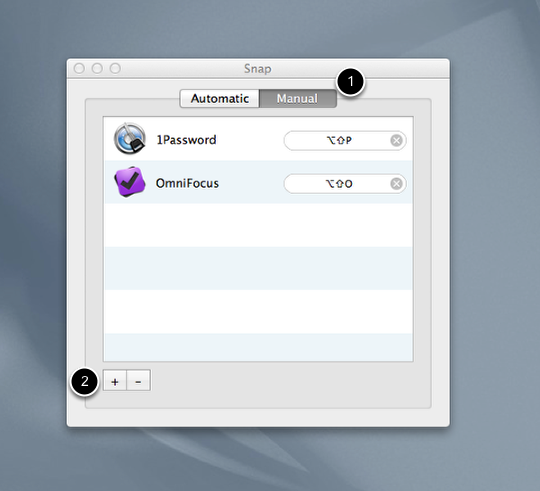 In addition to custom keyboard shortcuts which we’ll get to in our next step, Snap will also open up items in your dock using the key you specify in the lower preference area – for example command / ⌘ as shown above, so ⌘ 1 will launch the first item in the dock, ⌘ 3 will open the third item. In my actual usage I rarely use my dock and don’t keep programs there for launching purposes but I can see this being really handy for a handful of apps that you use regularly. What we’re really looking for is the ability to create our own keyboard shortucts. 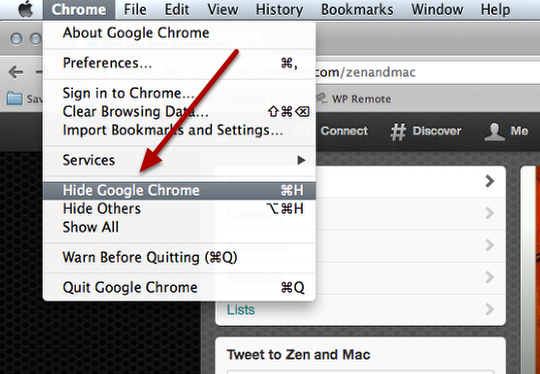 Click on the Manual tab which will show you any pre-existing shortcuts you have made. Click the + to add a new shortcut to Snap. Clicking the + will open up your default Applications folder, you can move to another location if necessary. Single click to select the application you are wanting to associate with your new shortcut. 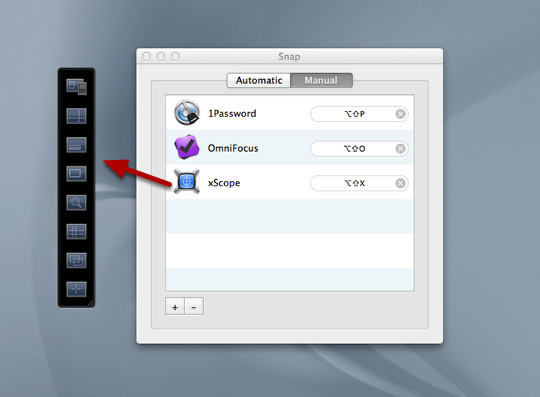 I have chosen xScope in the example above. Choose the key combination you wish to use for this shortcut by placing your cursor in the shortcut key box and then typing out the desired shortcut. It will appear in the box as you create it. In this example I have assigned alt – shift – x to be the desired shortcut. Click the Open button to complete the set up. I think this is a great time to test the new shortcut we’ve just created since you’ve got the key combination right there and it’s still accessible if you need to make any changes. In this case pressing the alt-shift-x does indeed bring up my xScope palette. What’s really handy is that once you have the application started and running, using the key combination will bring the already running application to the front and while active, hitting the combination again will hide the application. This makes it really easy to pull up frequently used applications and to quickly access and hide them during the course of your day. As mentioned, Snap is a free download from the Mac App Store and fills a nice gap for those who are looking to become more keyboard savvy and want access to their frequently used apps quickly and easily. If you use your computer to do multiple things then chances are you are going to have different programs running to help you accomplish all that you need to do. A browser for Internet, maybe an email client, an RSS Reader, Word or Pages, a to-do list, all open and at the ready for you to use throughout your day. Being able to easily and quickly navigate between these programs as you need them can let you work more seamlessly to increase not only your efficiency but also your overall happiness with your computer. In this guide I will share some of the more convenient ways to switch among and organize your running programs as well as share some of the potential pitfalls that I encountered when I was a new Mac user. 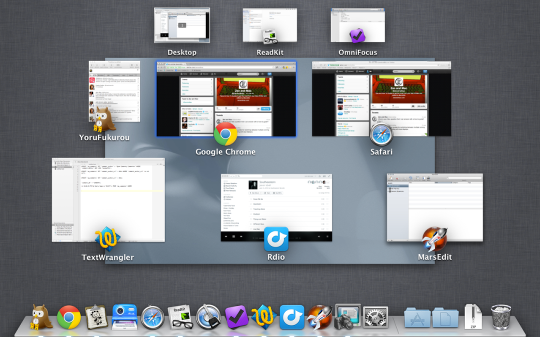 Your Mac is a true multi-tasking environment and as such allows you to run many applications at one time. All of these applications have windows that contain them and all of these windows exist in various states at all times. The window or application which is currently selected is called the active window and the main Menu Bar at the top of your screen will change or adust to show you the options specific to that program. For example in the above image you can see that my menu bar lets me know that my Chrome browser is my currently active application. You can always just use your dock to select any application which you want to be active. Your Dock will show you both running programs and those that are set to always appear there for launching. As you open new programs throughout the day they will then appear in your dock area even if they wouldn’t otherwise. You can tell which items are running and which are merely shortcuts by the presence of a small indicator light beneath the icon. It seems that they have reduced this in recent OS versions but you can still the small dashlight beneath the icon. Clicking on the icon of any running program will bring that applications window to the front and make that the new active application. The key combination of command-tab is one of the handiest keyboard shortcuts around and probably the one I use most frequently throughout my day. Activating this combination will bring up an overlay of all of the running applications and allow you to cycle through them. Keep the command key pressed and continue to press and release the tab key will move the indicator through the available programs. When you have reached the one you want release both keys and the application you selected will become the new active application. A quick command-tab and release will let you cycle between the first two programs in the list so you can move back and forth quickly. This is great when you are copying and pasting from one source to another or are using a reference that you need to get back and forth to quickly. Shift-command-tab will move you through the list in a right to left order as well. One of the things that is frequently confusing to new Mac users (myself included) when using the command-tab is when you see something like this. I went through and selected Chrome from my list and it appears to be the active program in the menu bar but where is the window? Right now it’s my Rdio app which was running as well. Chrome is active but not visible. This happens when the application window gets minimized – the keyboard command does indeed make the application active but it doesn’t restore the application’s window. The separation of the menu bar from the application window is a fundamental difference between the Mac OS and Windows and I guarantee it will catch you at least once. The easiest way to avoid something like this is to just never minimize an application window. They are perfectly fine running behind other windows and don’t need to be reduced. Actually this usually happens when folks use a combination of the mouse and the keyboard. The mouse finds the minimize button easily but then can confuse you when you use the keyboard commands to access it again. The next tip will help you overcome the need to use your mouse for minimizing. My next favorite key command is command-h to hide the active application, or you can access it from your menu bar. Unlike minimizing which just reduces the application window, hiding will basically just remove the entire application from being at the forefront of your screen and replacing it with the one just underneath. When you use your command-tab combination to re-access the program the window will still be open and accessible. A handy way to view all of your running programs is to view them using the Mission Control view accessible by pressing your F3 key or by using a four finger upward swipe on a trackpad if available. This view shows you your active desktops (more about desktops and full screen mode in a future guide) at the top and all of the currently open windows beneath it. Just click on any of the windows to quickly move to that program and to make it active. Note that niether minimized windows or hidden windows will show up in mission control, only those with visible windows. I actually find myself using this view more and more frequently because it’s so easy to activate and it also allows me to move applications among desktops, and as long as I don’t hide or minimize I can access everything in one place. The nature of minimization, hiding, active windows vs. active application and such can be confusing at first and is one of the ways that the Mac OS can be frustrating, but like many such “features” you can learn to embrace them, work around them or ignore them. All of these things allow for a great deal of flexibility and customization to really make things work like you would want them to and most likely to fit in to your workflow. I hope that this guide gave you some tips and ideas on how you can optimize your own workflow and overcome any potential pitfalls or annoyances. 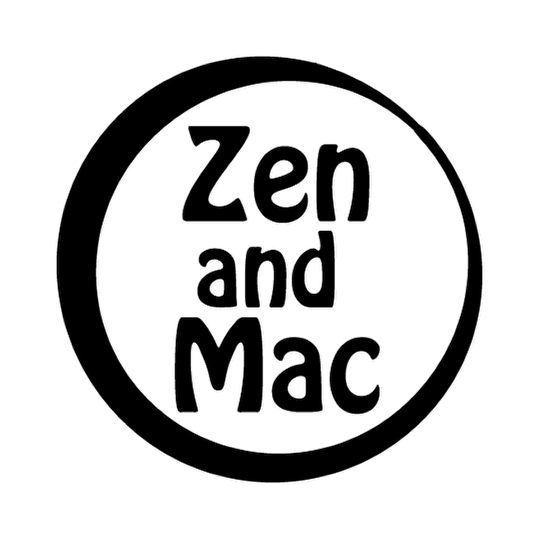 There is no right or wrong way to do these things but there are certainly ways to utlize these options to increase your own Zen while using your Mac. If you frequently receive text from others for use in your work or projects you probably find that it is often messy, containing extra spaces, misplaced caps, all caps or even no caps. Also, if you grab it from a web page or a Google Doc, your text can contain formatting that can affect how it looks when pasted in to its final home. A good way to remove that formatting as well as to do other text manipulations is to use a good text editor like TextWrangler.